Space flyingboat; Where the frak do I start? I 'landed' on Eve earlier. Parachutes don't aim very well, so I ended up about 200m offshore. 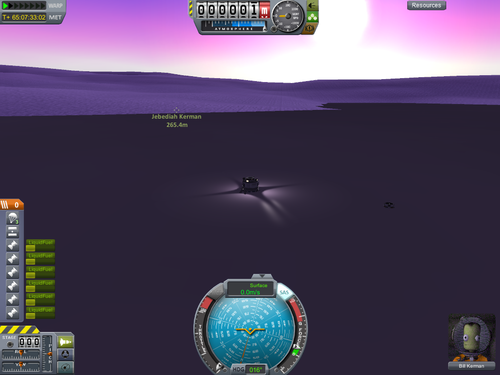 A 5-minute swim for Jeb, and Bill sort of exploded when he tried to get the lander out the ocean and to dry land. From that, I concluded that I need a boat. A boat with rockets on to decelerate into an aerobrake, so I'm not dropping a nuclear-engined interplanetary transfer stage into a planet when I could be making use of it later. And with parachutes to slow down. And wings, so it can navigate to an actual landing side. I have no idea where to start with this. Or what'll float on Eve and what won't. Pretty much anything will float, unless it's really, really heavy. It's quite silly. Actually moving stuff through water is quite finicky and difficult, and I would advise against it. Has a part that makes your ship start in the water, so you don't have to make it amphibious and drive it all the way there. Also has pontoons you can put under airplanes to make floatplanes out of them. These almost work OK but require beaucoup strutting and really should never touch dry land. From what I can tell, a new update is in the works that seems to be working pretty well but ain't quite out yet. If this works as well as is being claimed right now, this might solve your problem, but you'll have to wait for it. I'm mostly looking for something that'll land on the water, and not sink like a stone, and still be able to get off the water again to get back into orbit/glide to land. And not capsize with a command module on top, as well. So why is the water landing important? If you're trying to land on one of the small isles you could always cut the chutes once they've slowed you down enough, do whatever burns you need to do to push yourself to shore and then land like you would on a non-atmospheric body. Because it's mostly water, I usually end up coming in at some crazy angle, and I haven't yet figured how how aerobraking affects my trajectory. A bump with an image of what I just knocked up. It's a bit unbalanced, currently untested. My money's on that totally exploding on contact with the "liquid" (because the oceans are NOT water). The only stock parts I know of that can survive making contact with the ocean at more than about 2m/s forward velocity are capsules. Everything else goes boom or at least breaks off. Even if you manage to survive the landing, you won't be able to take off again because it's impossible to push stock fuel tanks along the surface at more than about 5m/s no matter how many rockets you push with. The Firespitter pontoons are the only non-capsule parts I know of that can make an ocean landing successfully, and also take off again. So, I recommend you get Firespitter. Make a simple plane with the pontoons under it. Be sure to include ladders that reach down into the liquid because swimming Kerbals can't climb onto floating objects but they can grab ladders. You'll need to put wheels in the pontoons if you want to land on terra firma afterwards, and that will require you to strut every pontoon part to its neighbor about 4 times, plus strut each pontoon part to the wing or fuselage once on each side. Thus, while the pontoons will turn to slinkies as soon as they touch dry ground, the struts will at least keep the pieces lined up enough to taxi more or less in a straight line and allow you to take off from land. Crap. Redesign time, perhaps. Maybe that's why the first mission exploded, rather than impacting the rover debris. 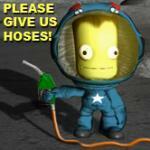 At least I can test this stuff on kerbin, though. If you don't believe me, give it a try. Hell, I could be wrong, but all my own efforts at seaplanes and boats (other than with the Firespitter pontoons) have ended in either total frustration (from it just running in place) or riotous laughter (from watching particularly cool explosions with funny side effects). I predict you'll have a good laugh out of it . If you want to build a boat out of stock parts, the only option is a hydrofoil. Make the underwater fins out of structural panels and I-beams, not wings. Be sure to give it very long side outriggers or otherwise it will uncontrollably roll over once it gets going. You will find it totally unable to turn, however, regardless of the number of rudder both above and below the surface, except at very low speed. But this is a pure boat, at best and amphibious boat, not a seaplane. AFIAK, the ONLY way to make a seaplane is to use the Firespitter pontoons. I think I'm going to go VTOL, then. Or rather, VLTO, because it's landing and then taking off. Have something come in, pop chutes, have it sit floating on it's backside, and take off from there. This will work just fine, as in your vehicle will survive (if it lands at no more than about 5m/s vertically with zero horizontal velocity) and be able to take off again (if it has enough TWR). What such a vehicle cannot do at all is move across the surface once it's down. Its mission success, therefore, is entirely dependent on landing closer to the Kerbals to be rescued than those Kerbals are to the beach. Just a case of making sure it's got enough wing area, then. I still want a glider, if only so I can pick and choose landing areas, rather than just get stuck with a ballistic arc.